Thanks Brett, Glad you like it. Mark, the current plan calls for only the engine house at the dump trestle. In an effort to provide more switching I have eliminated the car shops (hard to let go) and have added as many mine areas as possible. I have always felt that it is possible to have great operations with a minimum of track as long as you have the right type of operations. I finally have some layout progress to show, my kitchen project should be finished in the next two weeks, all the hard work is done and there is just some final details to wrap up. 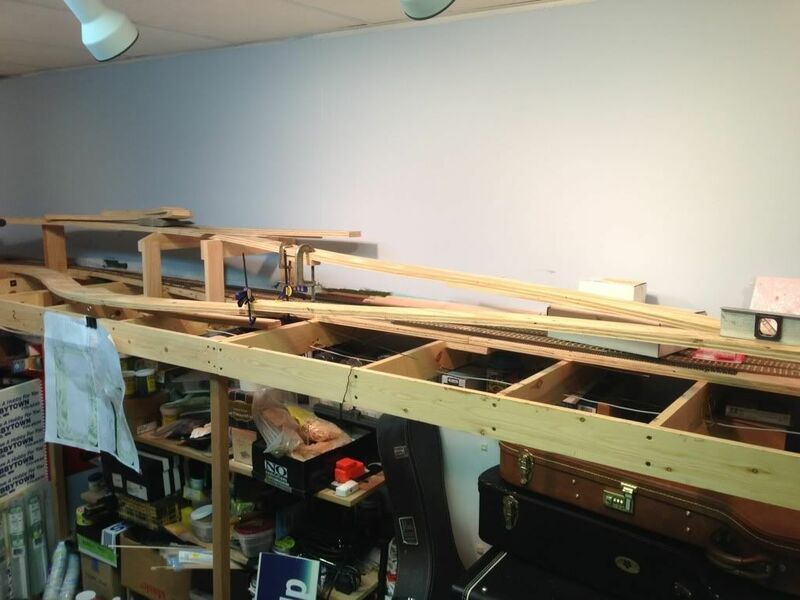 My layout room has been a mess while I stored kitchen parts in it and on the layout, it has also been the wood work staining room and the bench work made a great rack to sore wood. Over the weekend I took advantage of all the kitchen parts gone from the room and the room still a mess to mess it up even more with some lumber construction. I modified the backdrop by the closet to close off the end of the layout and I added the last piece of bench work over my workbench. Earlier I had cut out all the new roadbed so now it is just a matter of installing the roadbed. here is the current track plan, the areas in red are the areas I worked on this weekend. sorry for the poor photos, the Iphone is fine for construction photos but I don't have the control like I do with my DSL, when I get to taking photos of scenery I will get out the good camera again. here is the modified backdrop, I will get the joint mudded up this week and get some base blue paint on it to tie it all in. There will be a hole cut in it at the lower left for the switch back tail track. I sure wish my switch back tail track was visible but it just is not going to happen in my small room. One planning issue that came up was the closet is six inches deeper than I planned, I forgot that I made the change when I built the closet to make more space for the water heater to be removed. 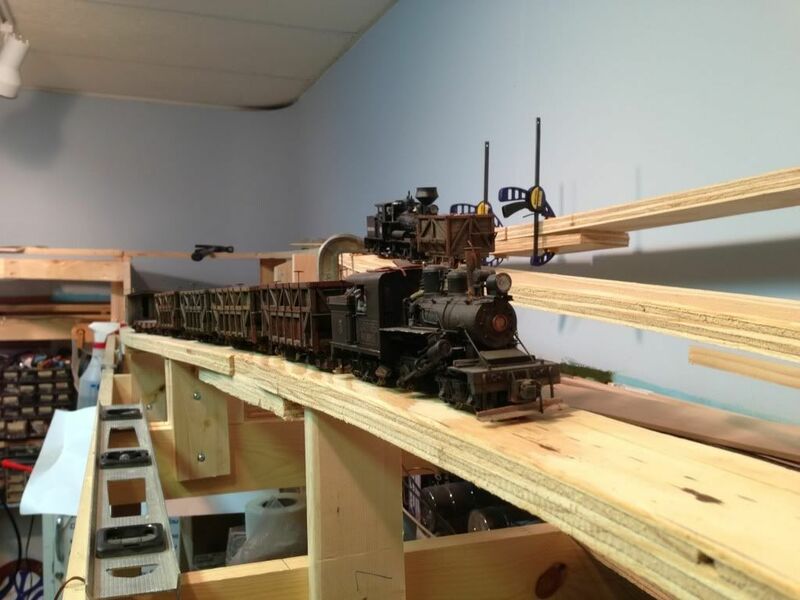 That six inches was critical to the track plan and it will not allow for the curve in front of the closet for the mainline extension, if I ever put it in. If I do expand the layout I will have to rebuild this area, which will not be that bad. here is the last section of bench work installed, the road bed is just sitting in place to check it. 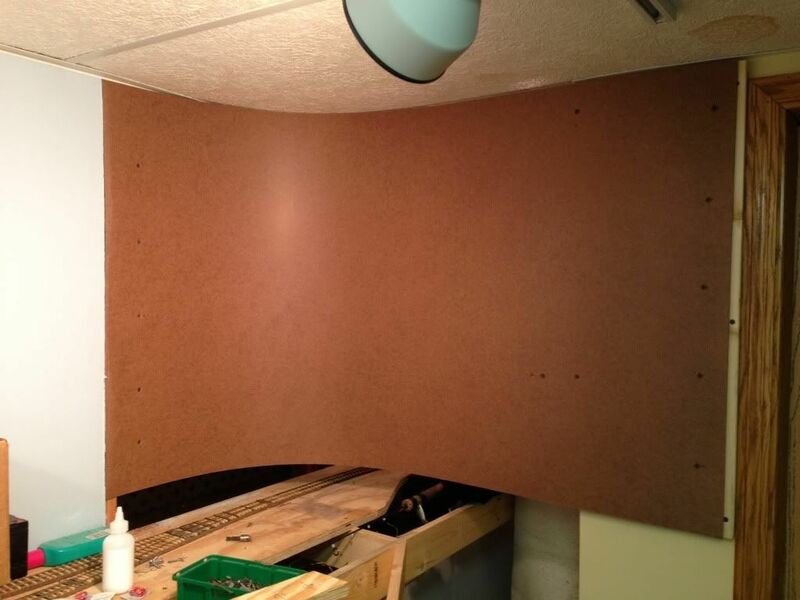 I will raise the roadbed up an inch so I can drop the scenery lower and also have the siding along the company store drop as well. this section of layout is not as high as I had planned, which will reduce the grade to reach it a bit, bummer, but probably is a good thing. Also, as it is now, the new area is about chin level, should be an interesting view. 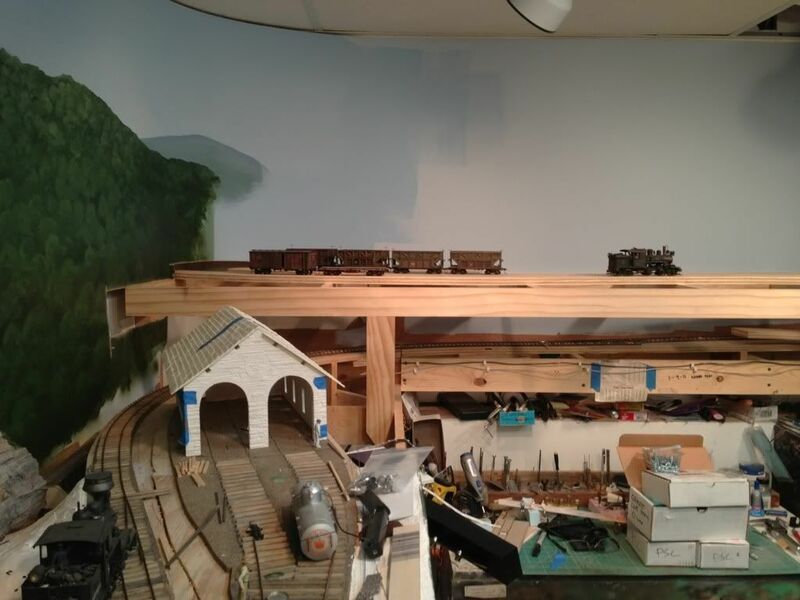 I also lowered this area a bit because I did not realize how close I was getting to the ceiling, not a big deal when I was in HO scale but the size of the O scale structures makes it harder to have high upper levels. here you can see how the new piece fits into the layout. I made this area its own section so I can remove it from the layout if I ever move, there will be lots of complicated machinery built into this piece to get the tipple to load and I would like to keep this area to build it into a future layout. this section of the layout will be separated from the lower engine house with a high tree covered ridge, a technique I used in three places on my last HO layout and it worked well. Please pardon the mess, I will clean it all up when the dust settles. I hope this is a sign of things turning around for me. Once the road bed gets installed I will get track laid up to the mine, including the run around, and I will start to work on the loading mine. I got back to the Heisler a little bit, cramming it in when I have had a few minutes. I took one link out of the chain so I could take out some more slack and the drive got a lot quieter and smoother, added a little grease to the chain, I know you should not have to but I did and it got even better. I did a little planning for the new cab. I am going to do a cab like my Shay #8. 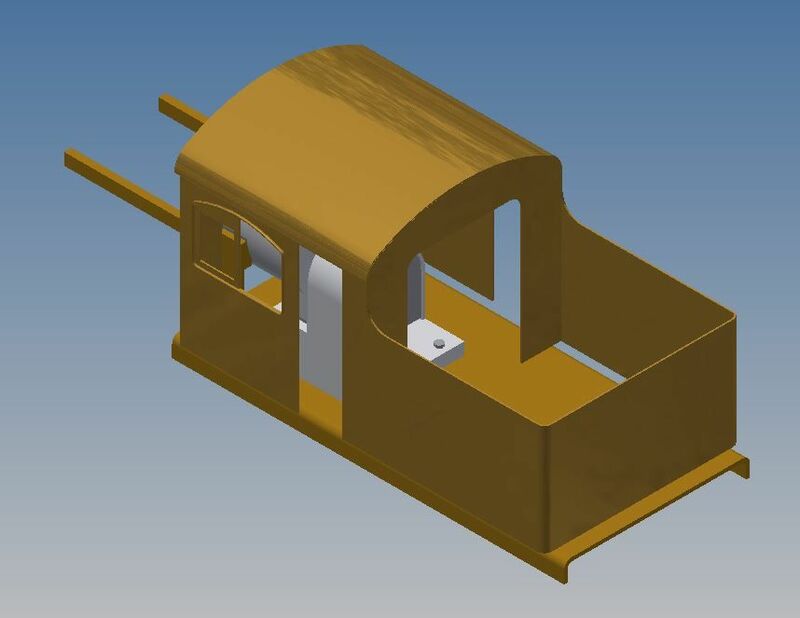 I have been laying out the patterns in Autodesk Inventor to see how the proportions are going to work out. Thanks for the updates. Looking forward to more construction and eager to see how the heisler will come together. Nice progress. Looking forward to seeing how the Heisler turns out. Still taking advantage of my layout room being a total mess and pushing the benchwork construction. 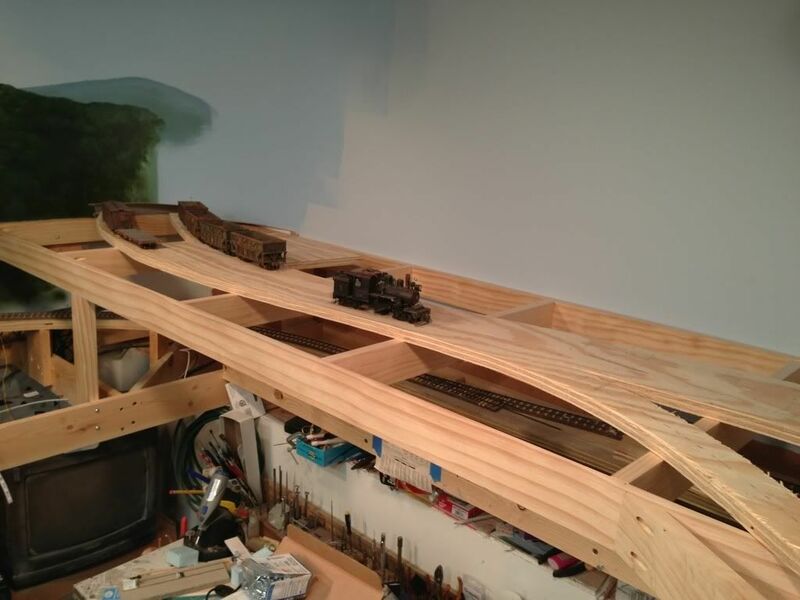 I got the roadbed in on the upper level and I am getting the switchback set before I drive all the screws home. 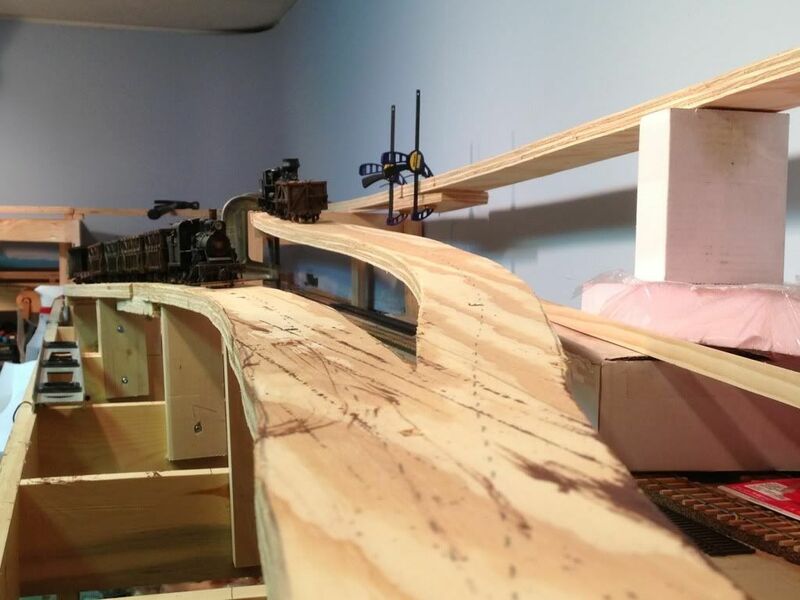 The plan is that some day I will use the grade in the foreground as part of the mainline and the switch back will be removed, so I am leaning toward making the switchback grade steeper, I just want to make sure it is not too steep. I hope to have all the mess wood stuff done by next weekend, including the fascia, then I will clean the place up and get the lower curtains altered and installed. Thank you for sharing the progress pictures. It is inspiring me to do some bench work. What do you think the max. grade works out to be on the switchback? I would guess about 4% from looking at your photo. How are you planning to clean your hidden track? I just calculated the grades and the mainline grade is almost exactly 3% and the switchback is 3.47%, I have not calculated the rear mine branch yet, I am going to wait until I get the tracks laid to the big mine before I start the line to the second mine. 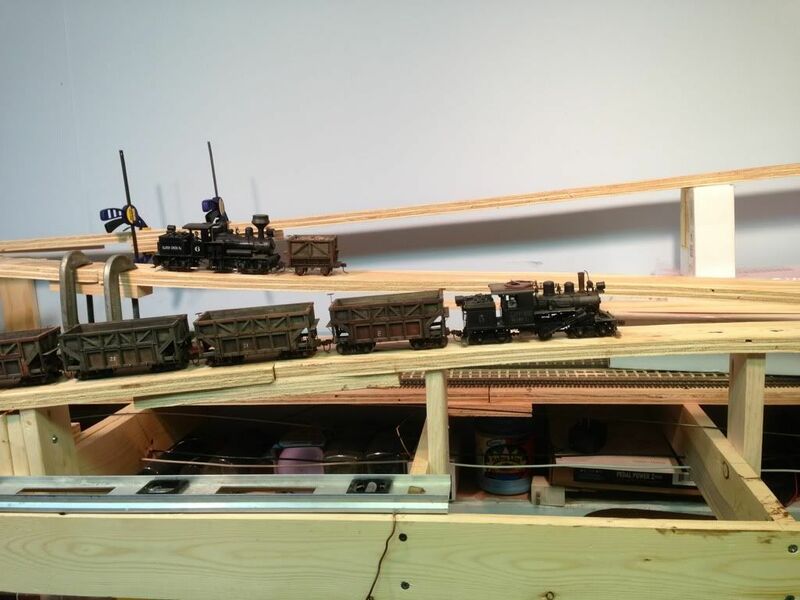 here are some photos with some trains staged on the grades, some photo angles make them look steeper than they are, I wish they were steeper than they are but maybe it is better since the loaded trains are heavy, and even though they are going down hill it might be better to have them they way they ended up being. 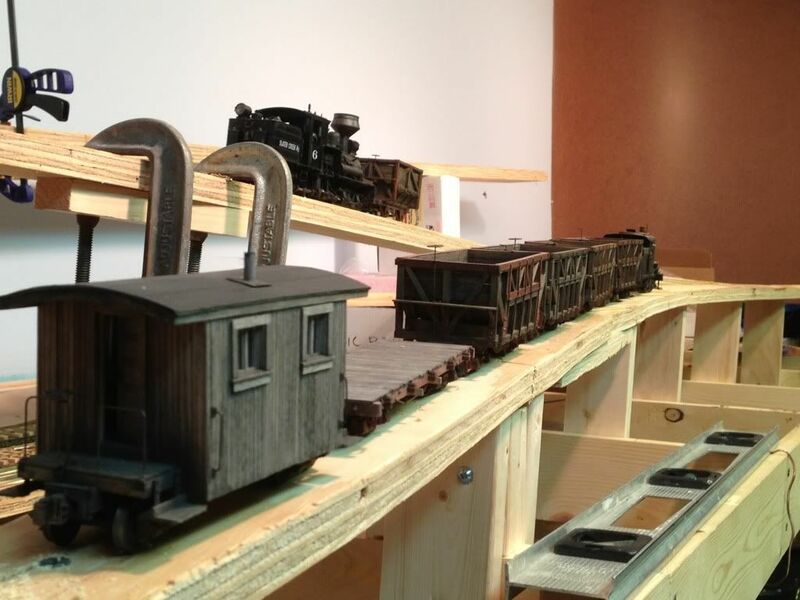 I'll tell you one thing, I am kind of liking the look of 5 car trains, they make the layout seem a little bigger. Looking good. Hope to pay a visit sometime in the next 12 months so keep working! In Carson City NV until flight leaves for BWI at 10:40 AM Tuesday but who's counting? well, I am a little embarrassed to admit that I made a bit of a math error, embarrassing because I design things for a living and I have to do a lot of math. Anyways, I used a level to figure out the rise over the length of the level, then I did the math when I got to work. I was talking about my grade to someone today at the local hobby shop and I started to think about the length of my level, I assumed it was 36" but after I thought about it I realized that there is no way my level is 36", I don't know what I was thinking, so I when home and took a second look at my level and then I realized it was 24" long, BIG difference, no wonder that skid mounted oil refinery I designed did not fit through the shop door , I guess that is another story. Anyways, my real grades are 5% on the mainline and almost 5 1/2% up the switch back, which is exactly what I wanted, trouble is that it is exactly what my Bachmann locomotives didn't want, can you say "ride em bucking bronco". My Kemtron shay went down it just fine and I am sure my PSC and Westside engines will work fine. So, the question is do I leave them and figure out a fix for the Bachmann locomotives later, they can be kept in the yards for switching, or do I lower the grades? I can bring down the mining area a couple inches and reduce the mainline grade to around 4%, with the switch back the same, it will just make a little less clearance above my hidden track. I think your Bachmann geared locos should pull those grades no problem. My Bman Climax drug a dead 4-4-0 (wheels locked) up my 4% grade of my switchback.....just for the hell of it. As far as being proto typical, 8% grades were not uncommon on logging roads and some went to 15%....then there were inclines. I've enjoyed following along as you build. Thank you for sharing the photos of the frame work. Judging by the placement of your trains I would guess that you are running these with Keep Alive capacitors. The trouble with the B-Manns is not the going up, it's the going down. I can pull my 5-8 car trains just fine going up, the trouble is all the bucking on the way down. I too have to use short trains. There is room for 5 cars & a loco in the runoff(run over? )30 inch sidings on my switchbacks. I would try to use a special hi-drag car coupled to the back end of the train to cure the herky jerkies on the downhill...if traction is not an issue.